Chef Pierre has come down from his perch above the range today to be your guide for a vintage dining experience. 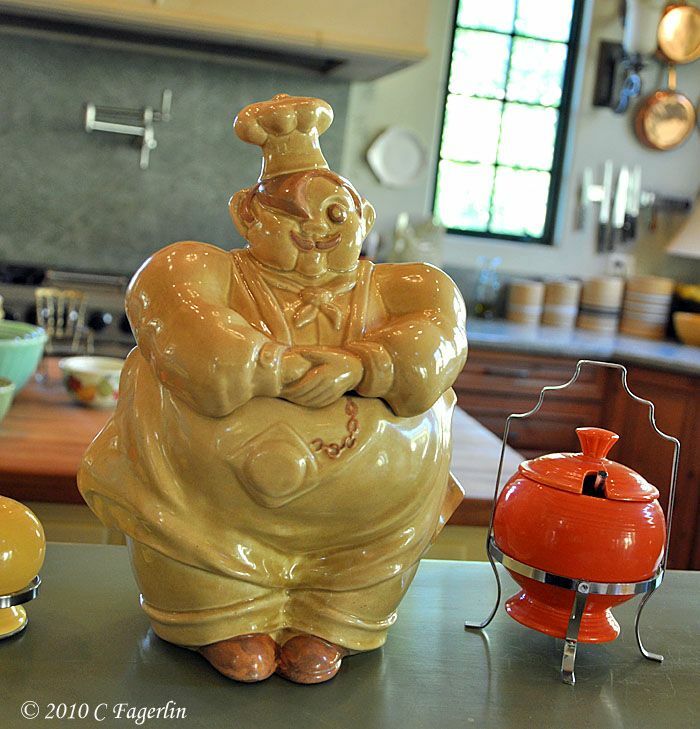 My vintage Red Wing "Chef Pierre" cookie jar lived with my maternal grandmother for almost 50 years and came to live in my kitchen almost 20 years ago. This piece was designed by Charles Murphy, a wildlife artist who worked with Red Wing in the 1940s and 1950s. Chef Pierre was designed in 1941 and there were two companion jars in the series, a Dutch girl and a Monk. Not "The Little Round Table" ???? Well you are correct, this isn't the same old same old little round table. This is a c. 1939 porcelain enamel top table that I've had for a number of years. The chairs are reproductions from Williams Sonoma. 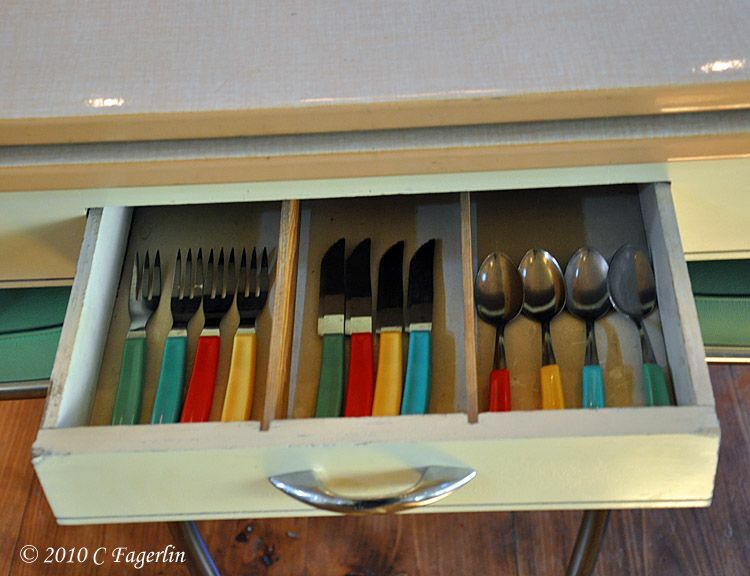 It has a little drawer that is a great place for flatware. And a leaf that pulls out and pops up from either side. 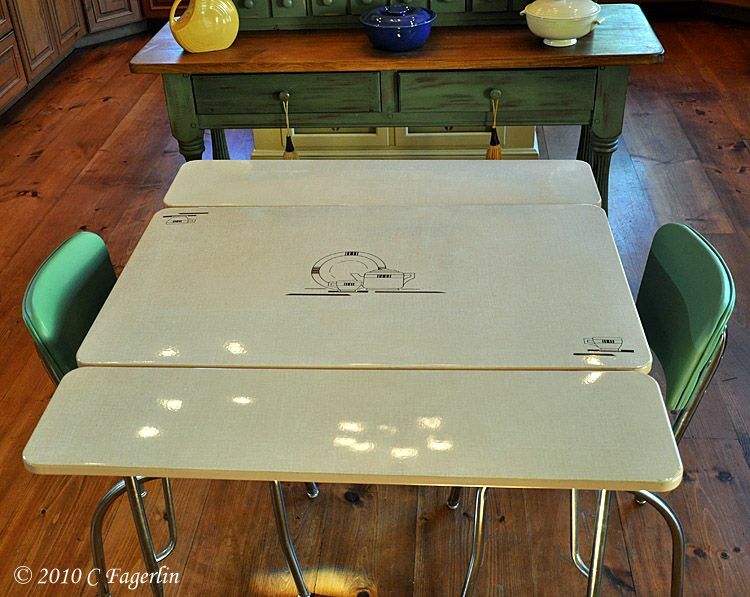 Some of these vintage tables came in plain colors and some had decorated tops. my obsession with all things dish related. Add Grandma's tablecloth and we're ready to set the table. 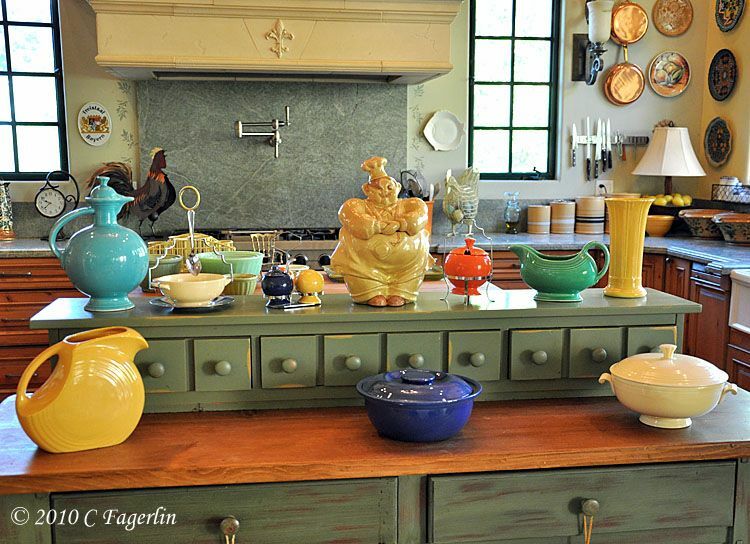 There are some Kitchen Kraft pieces glazed in Fiesta colors included, can you spot them? Wonderful pieces. I especially love the aqua chairs. I used to have a table pretty similar but it was before I knew how cool it would be. I was just married and it was in the apartment we rented. I liked it but now if I had it I would throw a party. love your taste. fiestaware is one of my faves. All your kitchen things are beautiful and look great together. I love your kichen! All the green is great! 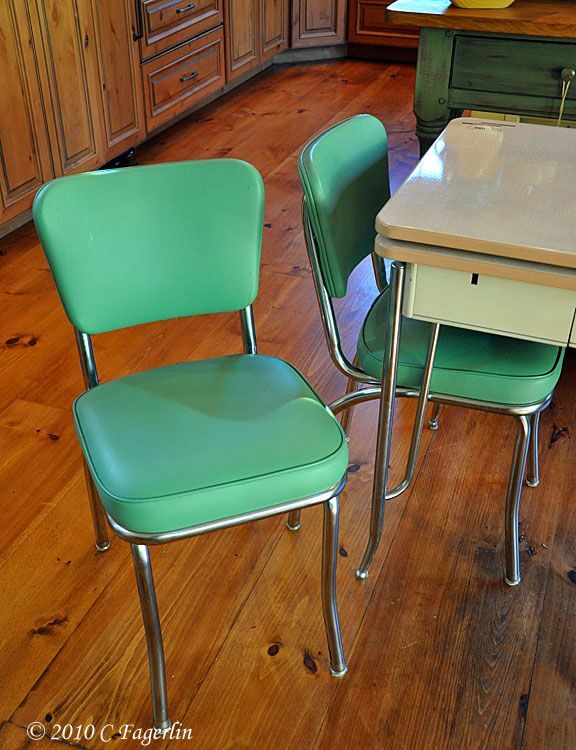 What a beautiful place you have, love all the green, cool retro table and chairs! oh what a happy happy kitchen, i just adore it!!! Wow your kitchen looks so great and very inviting! FIrst time to visit here...Love the look and all the green, my favorite colors of sage. Wow. That table is gorgeous. Perfect place for the Fiesta to be displayed. And the donkey centerpiece is great. Chef Pierre and the table are awesome. I love it all! That tablecloth looks brand new. So does Chef Pierre, for that matter. Very welcoming table. I didn't know they were reproducing those awesome chairs. They're great! Love it all. This table is awesome. I love all your go-alongs. 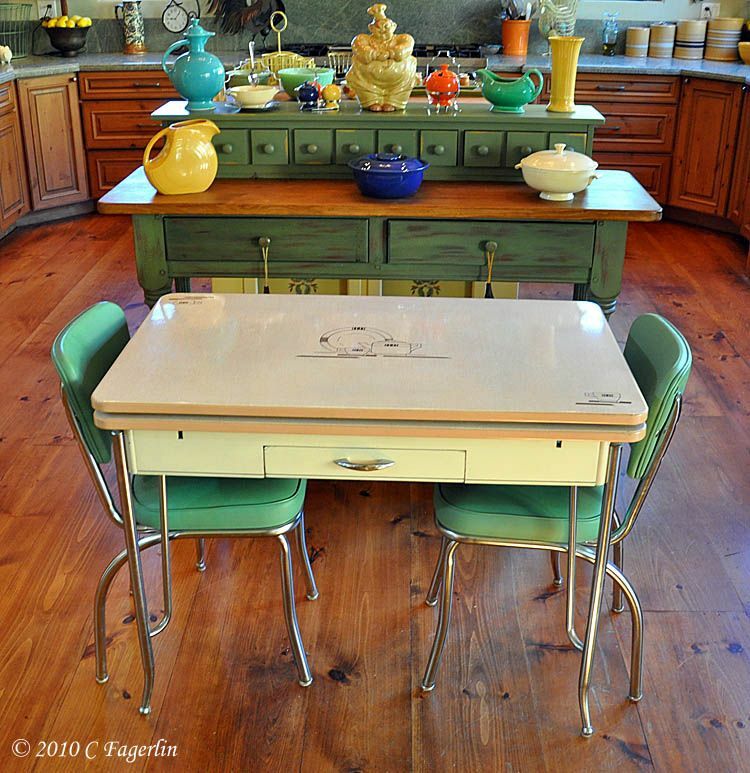 I love the vintage kitchen and particularly, the color green. I LOVE LOVE LOVE this kitchen. the floor are marvelous, darling. Cool post. Oh and your loge is cool too! Who needs food when there is so much colour for the eyes to enjoy on the table ? You have the homiest and most cheerful of kitchens! I loved every single photo! Your whole kitchen is BEAUTIFUL! OMG! I love that amazing table and wish I had one (those chairs too). 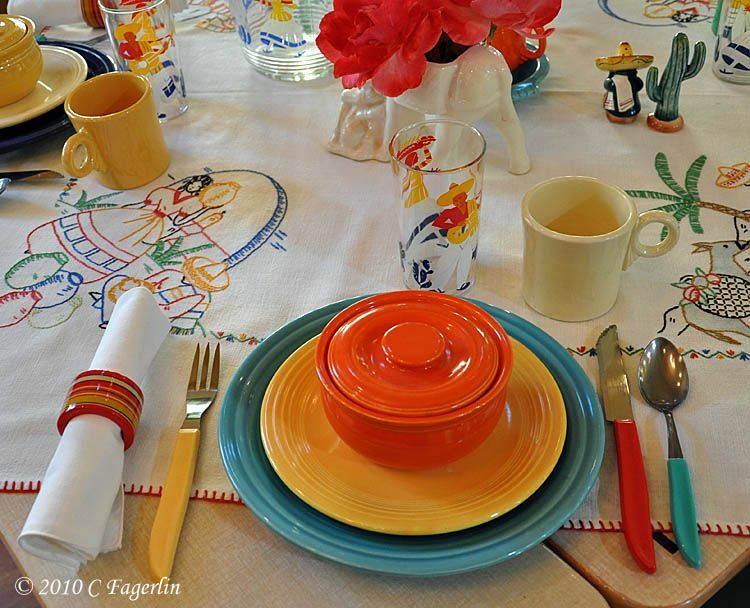 the table you set made me so happy, all those vibrant and cheery colors! Thank you! Marvelous! 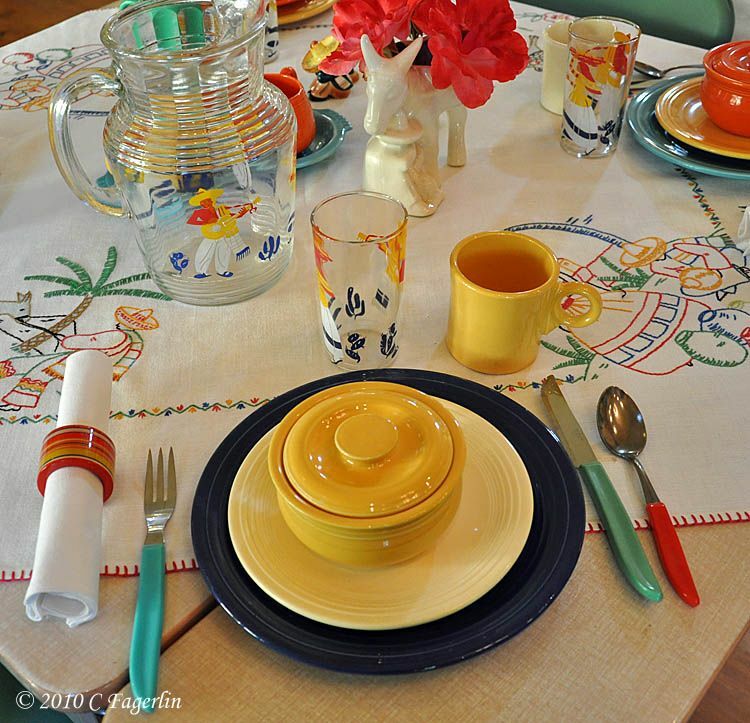 So many of my favorite things: family history, enamel top tables, colorful dishes and glasses, special linens...it's a bases loaded home run of a post! Lovely! 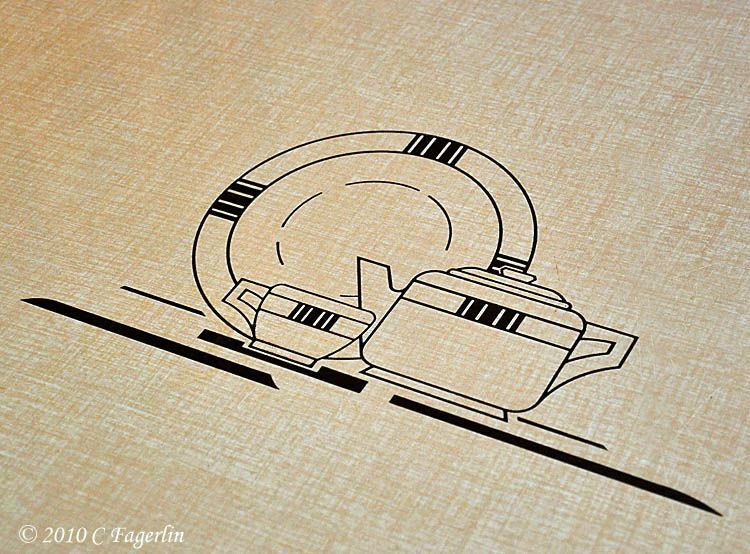 Your table is simply wonderful (as is your kitchen!) and the chairs are perfect. 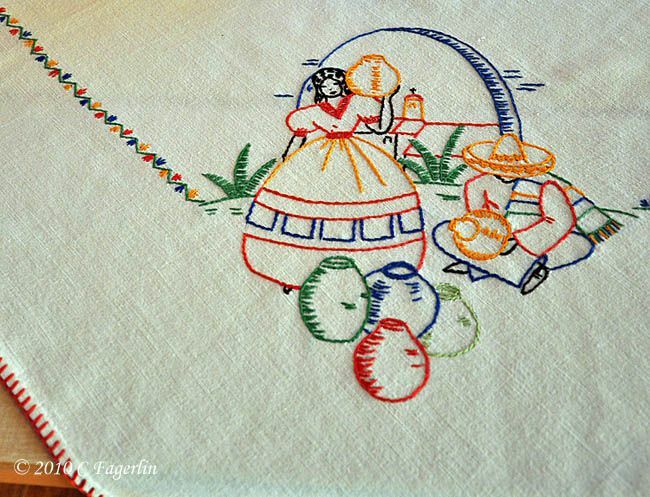 Your grandmother's tablecloth is in perfect condition!! 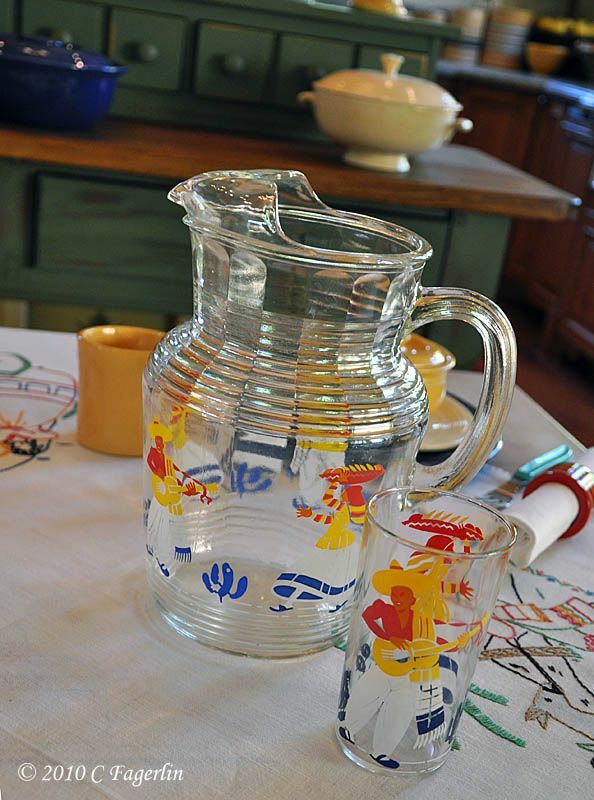 I think it is so neat that you've got that pitcher and glass set to match the tablecloth. This is one of my favorite posts of yours! He's back up on his perch keeping watch over the kitchen, thankful that he has made it through another year of earthquakes without any damage! Hope to see you all again soon for another visit here at The Little Round Table. 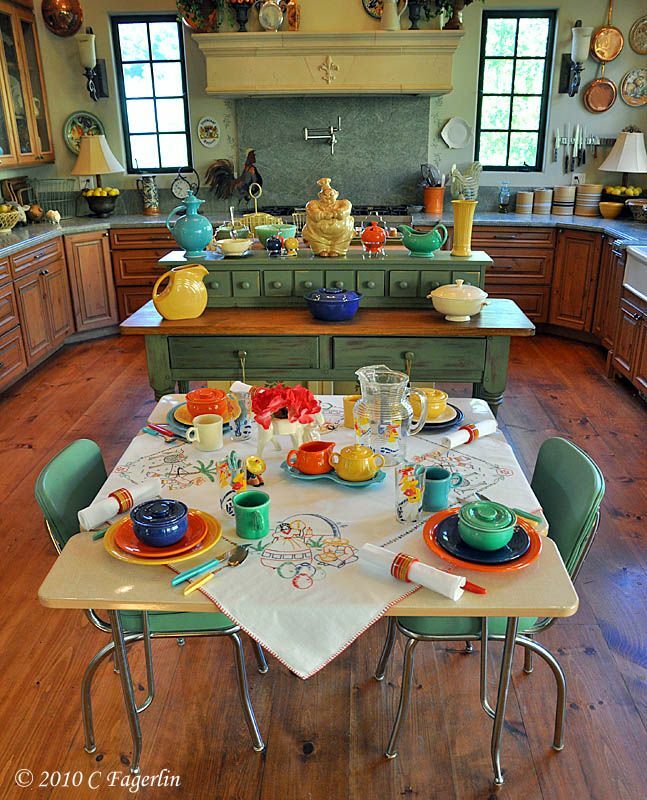 love the table and all the bright and cheery vintage fiesta and pottery! green looks more precious when it combined with other colors. Wow, you are really adept at putting these tables together! Makes me want to know what's being served! 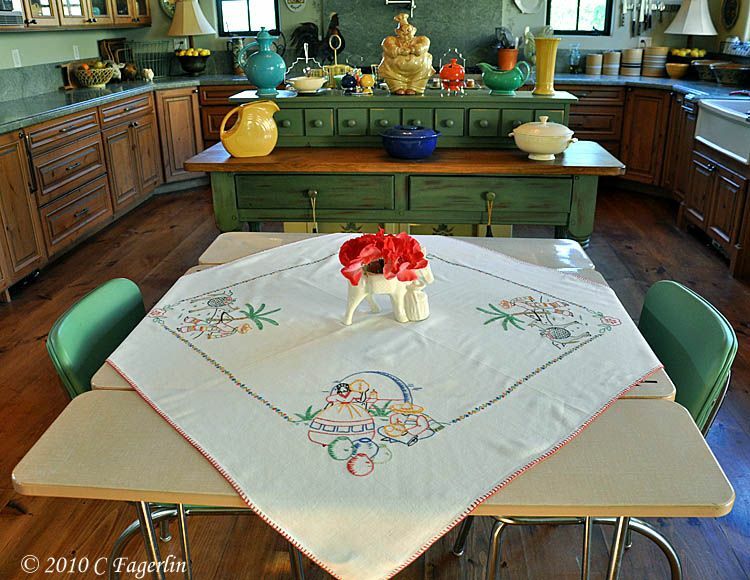 I love, love, love your vintage table and Grandma's tablecloth. 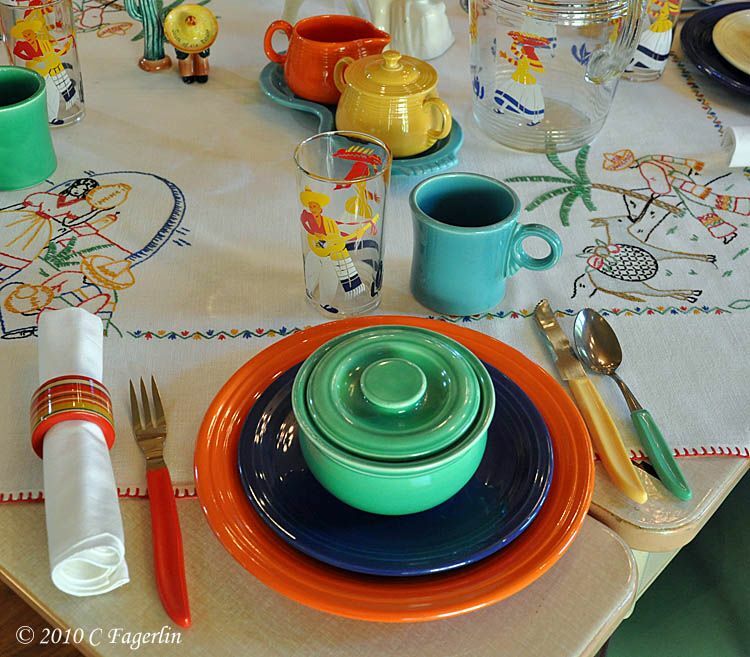 Your table looks great set with the Fiestaware. And Chef Pierre is wonderful, but I'd be a nervous wreck worrying about breaking him. You're so fortunate to have things from your grandmother. 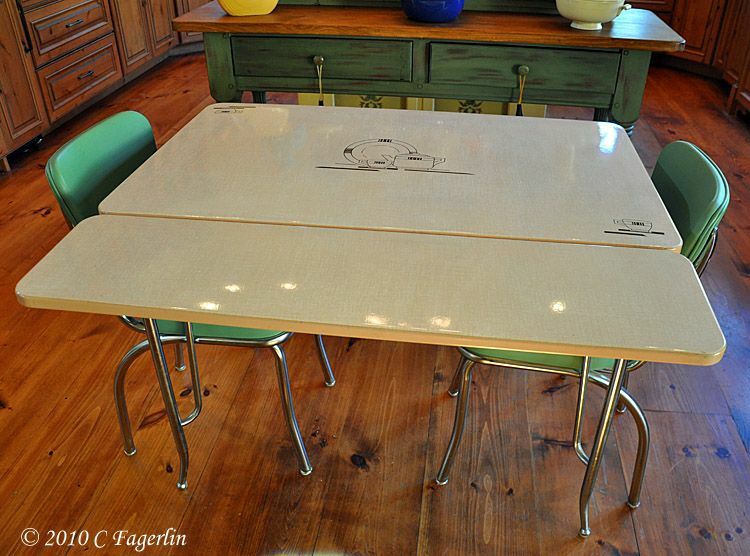 Oooh...I love your vintage enamel top table! 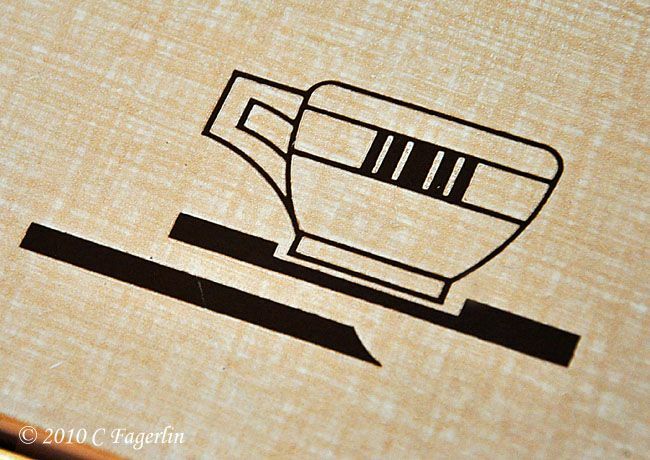 What a cute design of dishes on it too...so YOU, my friend! 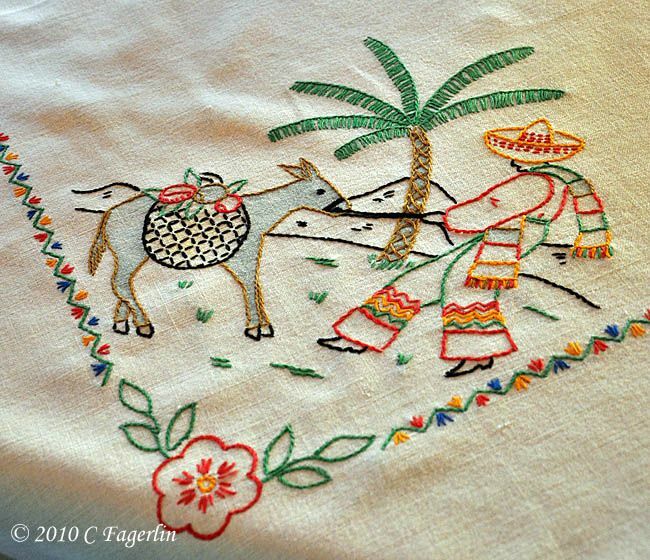 I believe I've seen your Grandmother's embroidered tablecloth before...it's sooo pretty and festive! In fact, the entire table is just so fun and festive! By the way...I love Chef Pierre! grandma's hand me downs, we have a few too. I love the vintage table...can I have it? Everything is eye popping for sure...very nice...Fiesta!! 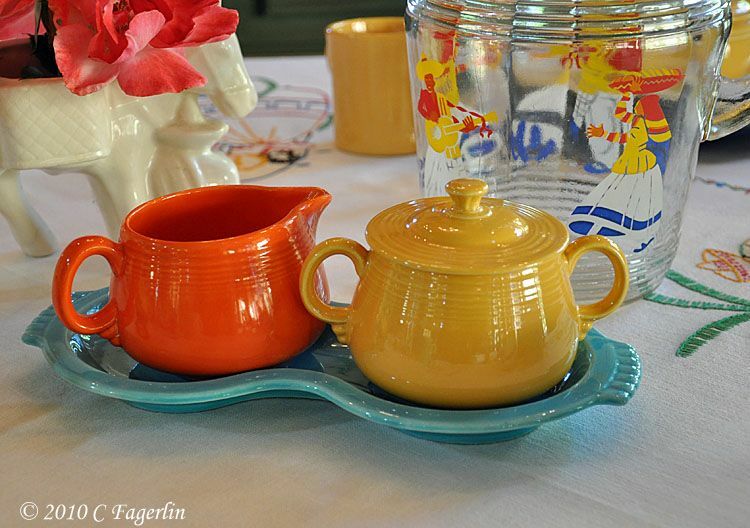 Love these vintage dishes - the colors are so cheery that one can't help but smile when they sit at the table!! But what really caight my eye is you gorgeous kitchen - so much room to work and move around!! Just lovely! THANK YOU !!!! For posting once again in your gorgeous kitchen, and for linking up to my Friday meme! :) I'm so happy to have you! Now, I've not noticed that cookie jar before - and I'm coveting! :) It's PERFECT!!! Great work this week. Love love love the table and chairs. Of course, everything looks nice but I am smitten with the chairs. Actually I am drooling. Thanks for showing them. That table is fantastic and I love your bright Fiestaware. Visiting from Mustard Seed Creations. 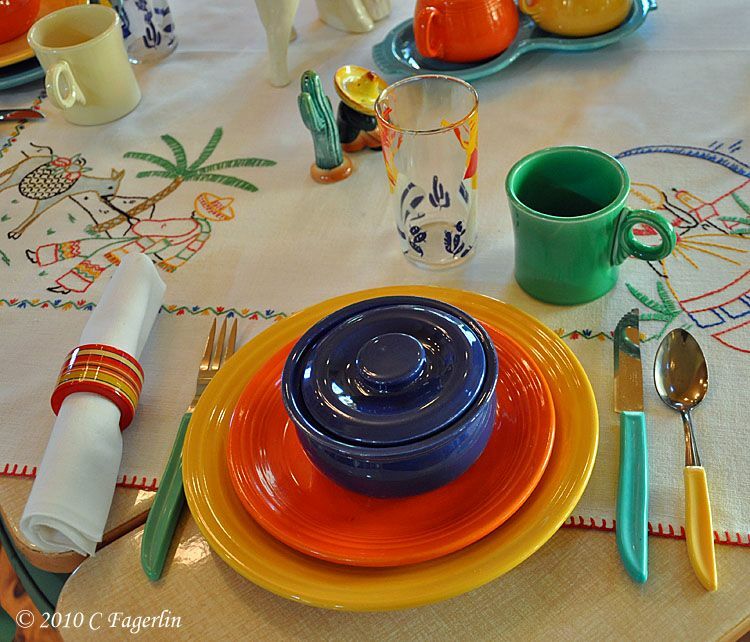 it is beautiful....I love the fiesta ware! 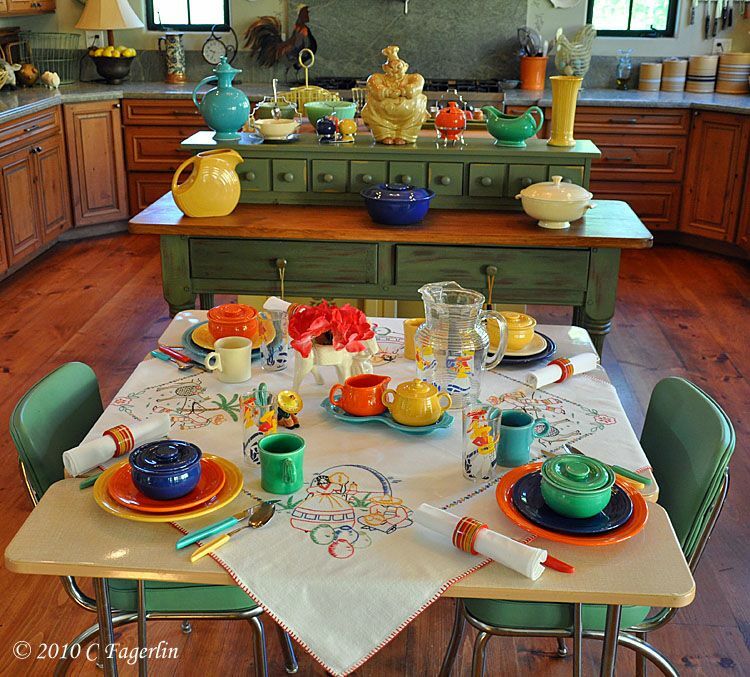 Wow, so many beautiful things in this post, great fiestaware as always but Chef Pierre is too cute and those chairs are awesome! I have a table really similar to that. It was my grandmothers kitchen table. I don't have the print on top and that was really interesting to see. I've never seen one like that. Mine is red and I just cherish it. I am coming to your house! Absolutely happy and lovely and vintage without being cutesy and I totally adore everything in your vignette. The dishes and glasses are incredible. I really, really like your style. Thank you all for coming by to visit! And thanks for all your lovely comments. I love that little dinette table more than I could ever say. We had a table like that when i was a kid, except it had a red trim. My mom loved everything red. Thanks for coming by ladies, I do appreciate your lovely comments! LOVE this!!! We also collect vintage Fiesta ware. so much fun. I'm going to add your blog to my google reader. Thanks, hope to see you again sometime soon!